In this financial journey of yours be PATIENT with yourself because it isn't the markets which makes you RICH, its your Approach and Prospective towards the markets which makes you Rich ! SEE this VIDEO - https://youtu.be/YpJ2KuU23jI if you wan to see my journey from being in 2 lakhs debt at 22 yrs age to guiding over 2,000+ trader make money in Indian Stock Markets. 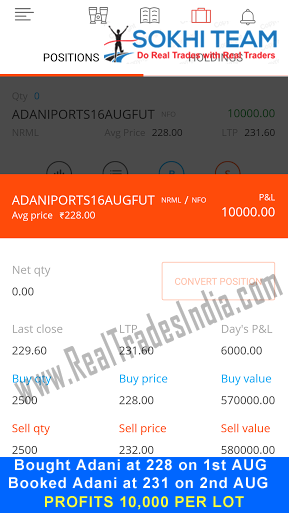 If you remember ADANI PORTS gave all members of SOKHI TEAM an AMAZING 40,000 - 50,000 Profits Per lot in 5 trades ! Yipeeeee !